Café, coffee shops, bar and restaurant owners. A new menu system we’ve developed that allows the timber rails to be directly mounted to the wall with no visible fixings showing. Price includes printing 9 individual words/menu items & prices from your menu. Designed by G&G and made in our London workshop. Can also be as barber's board and for shops/retail. Click here to download our menu template (Opens a Word Doc). Once completed please send to sales@goodwinandgoodwin.com. Need a bigger size? Need more menu lines? Need a specific RAL colour? Need your brand font? No problem! 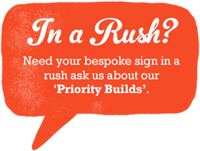 Please contact us for bespoke enquiries. Width: 100cm Height: 113cm (Shown here, other sizes available - just ask! ).